The Association for Promotion of International Cooperation (APIC)’s 2016 APIC-FPCJ Pacific-Caribbean Journalists Program was carried out from October 18 to 26, 2016. The program invited journalists from Pacific Island and Caribbean countries which are affected by natural disasters and climate change, and facing issues including waste disposal, to cover Japanese initiatives and knowhow that could be applied to solving problems in their home countries. The program was planned and operated by the FPCJ, under commission from APIC. 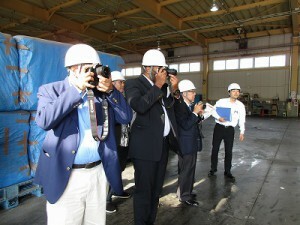 After visiting government institutions around the Tokyo area, covering mainly environmental topics, the group went to Miyagi prefecture for three days to cover the Great East Japan Earthquake. The journalists all strongly believed that by reporting on the cutting-edge initiatives being carried out in Japan, they could help their home countries overcome their own vulnerabilities, and were tireless in their efforts at each stop. At the end of each day, the journalists would hold a meeting along with program coordinator Mr. Takeuchi, discussing what they covered that day, and would then write an article that same day. In Kawasaki, around a theme of waste disposal the journalists covered how waste was separated at an apartment and a business involved in recycling. 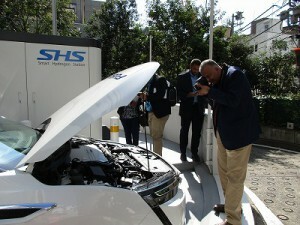 At Honda, the group covered renewable energy, including hydrogen vehicles. Honda is involved in efforts for energy self-sufficiency and a shift to renewable energy in the Marshall Islands. 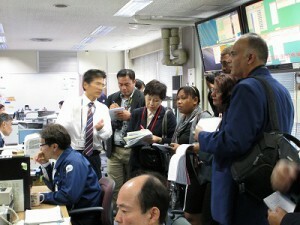 At the Japan Meteorological Agency, the journalists learned about systems to monitor and provide information about natural disasters. 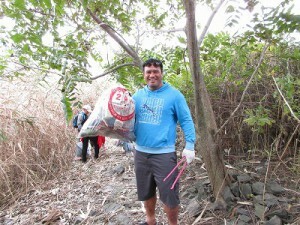 On the weekend, the group participated in Arakawa Clean Aid and helped clean up the riverbank. This was an example of how normal citizens work to help keep Tokyo clean. In Higashimatsushima, Miyagi, the journalists covered the damage from the Great East Japan Earthquake and the current state of recovery. 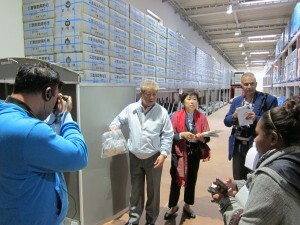 This photo is of a large storehouse containing food and other necessities, based on the lessons from the earthquake. 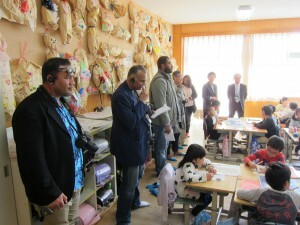 The journalists observed a disaster safety class at Shichigo Elementary School in Sendai. Disaster safety classes are held weekly for each grade, to apply the lessons learned from the Great East Japan Earthquake for the safety of the children. After returning to the hotel, the journalists would discuss what kind of article they would write based on what they had covered that day.